The Saskatchewan Huskies took full advantage of their opportunities Saturday afternoon, handing the fourth-ranked Calgary Dinos their first on-field regular season home loss in more than six years with a 38-35 triumph at McMahon Stadium. The loss snaps a nine-game win streak for the Dinos over Saskatchewan and was the first regular season defeat at home since the first game of the 2010 season, notwithstanding a forfeit in early 2014. The loss drops the Dinos to 5-2 on the year with one game to play, while Saskatchewan improves to 4-3, clinching a playoff spot. Kyle Siemens completed 25 of 38 passes for 359 yards and two touchdowns for the Huskies in a back-and-forth game that got more interesting than it maybe should have been down the stretch. On the final play of the third quarter, Siemens ran in a one-yard touchdown following a 62-yard passing play to Chad Braun on which the Dinos were unable to overcome sloppy tackling – a theme to the contest. A roughing the passer was tacked on – orange nylon being another theme – to set up the ball on the one-yard line, and Siemens’ TD gave Saskatchewan the lead at 23-22. Through the next 10 minutes, the Huskies found the end zone twice more thanks to a nine-play, 78-yard drive capped off by Tyler Chow‘s five-yard run, with Chow scoring a one-yard TD on Saskatchewan’s next possession. That TD, however, was a field goal until an unnecessary roughness penalty on Calgary with Sean Stenger out to split the uprights turned third down into first and Chow waltzed in. That four-point swing would come back to hurt the Dinos as the game turned wild in the final three minutes. After a two-and-out, a Calgary punt was mishandled by Braun and recovered by Denzel Radford, setting up a one-yard toss from Adam Sinagra to Anthony Anderson to pull the Dinos closer. The two-point convert attempt failed, making it 38-28 with two minutes to play. After the Huskies recovered the onside kick, Siemens fumbled the snap on a routine third-and-inches play, and Calgary’s Nick Statz picked up the loose ball and ran it back 60 yards for another major to bring the Dinos within three at 38-35 – but again, Saskatchewan recovered the onside kick attempt to seal the victory. All told, Calgary was flagged 16 times for 133 yards in the contest, while the Huskies picked up just seven penalties for 59 yards – clearly a difference in the ball game. Case in point for Calgary was Yol Piok‘s touchdown late in the opening half. Siemens found Piok just across the Saskatchewan 50-yard line, and the receiver pinballed off a couple Dinos defenders who couldn’t wrap him up and took off downfield. Three Dinos converged on him inside the 10, and Piok managed to carry all three of them into the end zone for a spectacular 65-yard touchdown. Saskatchewan’s other score came courtesy of a 16-yard pass by Siemens to Colton Klassen early in the first quarter. Sean Stenger added a trio of singles on the day. Calgary got additional scores from Sinagra (14 yards) and Josiah Joseph (one yard) on the ground, with Niko DiFonte adding a missed field goal single late in the third quarter. In total, Saskatchewan out-gained the Dinos by a 446-317 margin. For Calgary, rookie quarterback Sinagra – playing for the injured Jimmy Underdahl – completed 21 of 35 passes for 230 yards and two touchdowns. 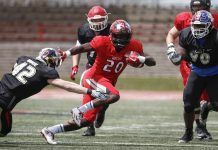 One of those, a 15-yard strike that gave Calgary its first lead in the second quarter – went to Brendon Thera-Plamondon, who was making his first appearance in the lineup of the season. Thera-Plamondon finished as the team’s leading receiver with four catches for 55 yards. Bryce Harper managed 48 yards on 17 carries for Calgary with Sinagra not far behind with 44 rushing yards. Chow led the way for the Huskies, picking up 84 yards on 16 carries. Calgary’s Hunter Turnbull led all tacklers with eight, followed by Micah Teitz with seven solos and two assisted. Jacob Solie and Ben Whiting paced the Huskies defensively with six and 4.5, respectively. With one week of Canada West play left, the playoff scenario remains murky. For Calgary, a win at UBC would clinch at least second place, while a loss coupled with a Saskatchewan win would, in all likelihood, send the Dinos to Saskatoon for the first round of the playoffs. It all gets underway Friday night when the Huskies host Alberta on Shaw TV (7 p.m. MT), followed by a pair of critical games Saturday as Regina heads to Manitoba (8 p.m. CT) and Calgary faces UBC in Vancouver (5 p.m. PT / 6 p.m. MT). 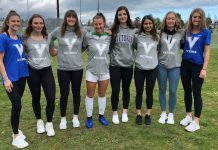 UBC Okanagan lost their second to last regular season game at Nonis Sports Field to the visiting University of Saskatchewan Huskies on Saturday, October 22 as Heat women’s soccer team was blanked (2-0) by their prairie foe. With a 74-69 win over the host University of Saskatchewan Huskies, the University of Calgary Dinos took the title of men’s basketball Graham Shootout Saturday at the PAC. It is Calgary’s third Graham Shootout title. The Dinos finished a perfect 3-0 at the tournament and improve their tournament record to 12-6. Saskatchewan finished the tournament 2-1, while the Algoma Thunderbirds finished 1-2 and Red Deer College Kings 0-3. Calgary’s Thomas Cooper was named the tournament. 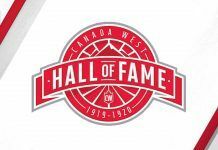 Tournament All-Stars included: Manbi Diawara (Calgary), Ian Tevis (Red Deer), Adam Benrabah (Algoma), Shane Osayande (Saskatchewan) and Jaylan Morgan (Saskatchewan).